The Dublin Unified School District has a small problem. However, it is a problem that many other school districts would wish to have. In 2006, the Alameda County Office of Education (ACOE) released a statement that 11 of its 18 districts would experience a decline in enrollment over the next several years. The notable exception to this was DUSD, which was projected for a +7.35% increase in the immediate term. This conservative estimate turned out to be more than accurate. With the rapid residential development in Dublin Ranch, Positano and beyond, DUSD has elected to take action to ensure that this exponential growth could successfully be managed. The opening of the new Amador Elementary School in 2015 needed to be factored into this equation. In addition, there are plans for the construction of a fifth elementary school (E-5) in the vicinity of Jordan Ranch sometime in the future. But before one can look too far ahead, the immediate term requires immediate attention. Six months ago, the district assembled a formal Boundary Committee to examine and to construct a five year plan that could then be placed in consideration before the Board of Trustees for implementation. The committee consisted of numerous stakeholders including Parents, Teachers, Trustee members, School Administration and District Staff. Tess Johnson served as the Boundary Committee Chairperson. The group met numerous times starting in the spring of 2014 and into the fall. The goal was to solicit feedback/suggestions from the parties that would be directly be impacted by any boundary changes and to then crystallize multiple options for the Board of Trustees to consider. The plan is two-fold. One, critically examine the options that make the most sense in terms of “student load” vs. a school site’s actual capacity. And two, ensure that the residents potentially impacted would have a voice in any proposed changes. DUSD’s presentation at the community forum is available here. 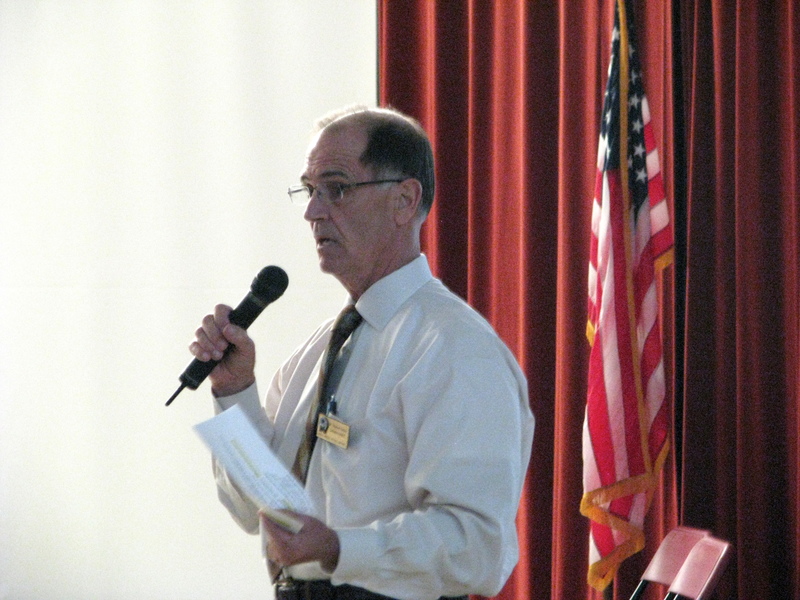 The first of the two public opportunities occurred at Fallon Middle School on Monday evening. 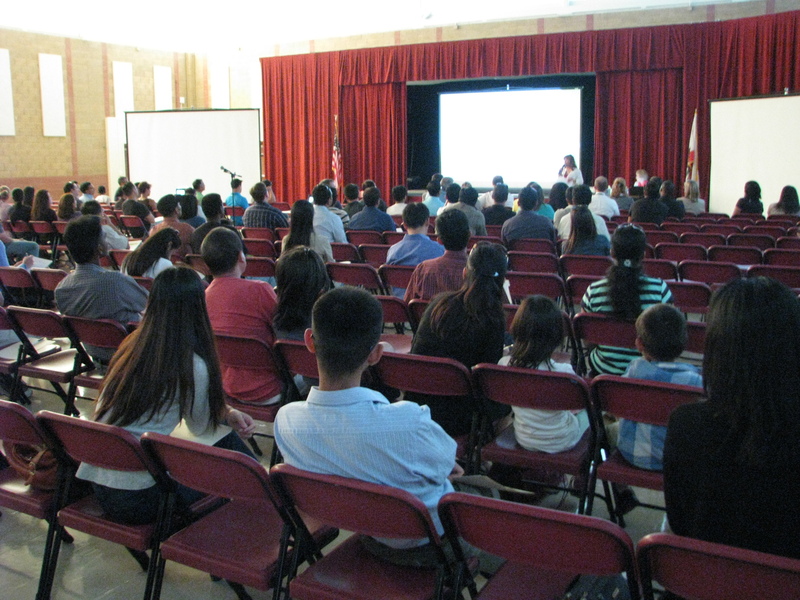 Approximately 70 parents filled the Multi-Purpose Room to engage in the presentation. While DUSD had established a threshold of 650 students (100+/-) for each elementary school, the rapid growth has easily lapped this vision – all across the district. In response, portable classrooms have been installed at Dougherty, Green and Kolb Elementary schools in the last several years. While the 2015 opening of Amador Elementary will ease a portion of this crowding, it was still evident that a longer term vision was desired and needed. Consulting Demographer Blair Aas delineated the major/natural division lines on a map projected on the screen. Ms. Johnson and members of the committee then highlighted three potential options or Scenarios for a boundary redraw. Scenarios 1, 3B and 3C represent specific iterations of how student load could be balanced throughout this region and relate to each school site’s capacity. In summary, Scenario 1 would maintain very high enrollment levels at Dougherty and at Amador, while significantly lowering enrollment at Green. Scenario 3B would level out enrollment through all five school sites. Scenario 3C would increase enrollment at Green and lower enrollment at Kolb. All three vehicles have their merits. However, the goal for the Committee is to forward their recommendations along with public feedback to the Board of Trustees in late September. The Board will then entertain comments and strive to take action sometime in October. Another opportunity to participate in the process was held on Tuesday, September 16th at 6:30 PM at Fallon Middle School. Subsequent to the Tuesday event, a survey link will be provided on the DUSD website so that those who are unable to attend may add their views/comments. OneDublin.org applauds the District and the Boundary Committee for their efforts and outreach to those that may be affected for several years to come. The hope is turn the “problem” into opportunities. Can you delineate the merits of each scenario? Also, are the capacity calculated with or without portables? Albert, I wanted to reply to your inquiries. Our mission was to report upon the two public sessions at Fallon without advocating for any specific scenario. To a greater degree, the community conversations were successful. When you view the slide at the end of the piece, which delineates the student load vs. each site’s capacity, you may deduce that Scenario 3B may be the most favorable – for 2015 and into the immediate future. Regardless, a change in boundaries is necessary in order to level out the impact of opening a new elementary school. We have no “inside” information and it will be left to the citizens of east Dublin and the Board of Trustees to express their opinions in a proper forum. Pay attention to the DUSD Board of Trustees meeting agenda schedule to ensure that you and your neighbors take advantage of this opportunity to do the same. Thank you for your interest in this subject/post. Are there boundary changes proposed for Middle School too? Or the boundary changes only pertaining to Elementary school? Deepak, a very fair question and one that was raised on that Monday night. For now, DUSD is concentrating solely on the student load shift for the 2015-16 academic year at the current and impending school elementary sites. Once the boundary changes have been solidified in this year, they will then shift their focus to the important issue that you are raising. While we do not profess to have any particular advance information on this matter, it is our belief that the secondary (middle school) issue will be addressed shortly thereafter for the 2016-17 academic year. Our advice is to continue to consult http://www.dublinusd.org for updates relative to actions/comment opportunities that will be available through the district office and public trustee meetings.